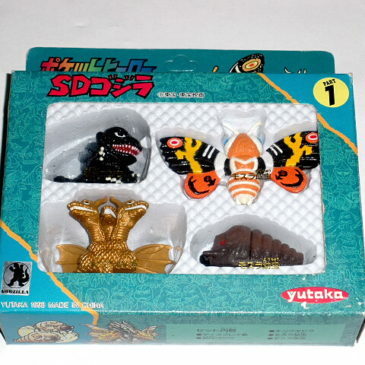 Here is the “Yutaka 1992 Godzilla vs Mothra Play Set. 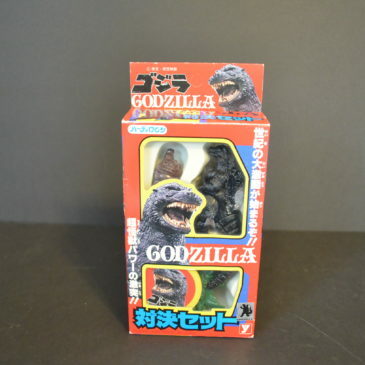 The Set contains a Godzilla that stands 3 inches and 2 Mothra larvas and Battrora larva each abotuj 1 1/2 inches. The box is in Near Mint condition. 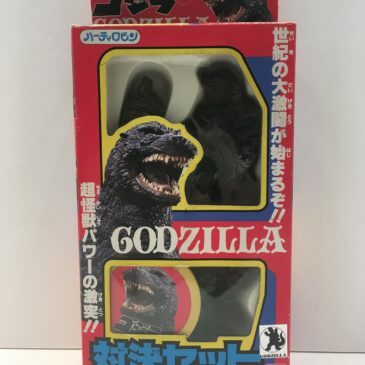 Made in 2000 by the Yutaka Co. of Japan, this 5 piece set of Super Deformed figures contains Megaguris, Godzilla 2000, 1964 King Ghidorah, Godzilla 1954 and MechaGodzilla 1974. Each Super Deformed figure is hollow and stands approx. 1 1/2 inches tall. 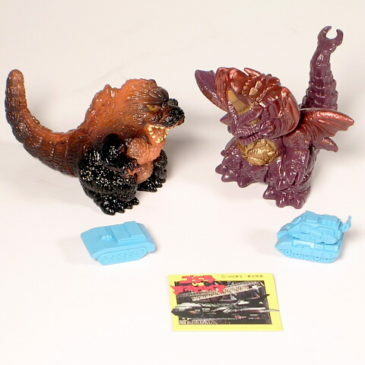 Super Deformed figures are also called “Finger Puppets” because they can fit on a childs figures so they can “Fight” each other! Comes in colorful good condition box. Made in 2000 by Yutaka NOW out of PRODUCTION. 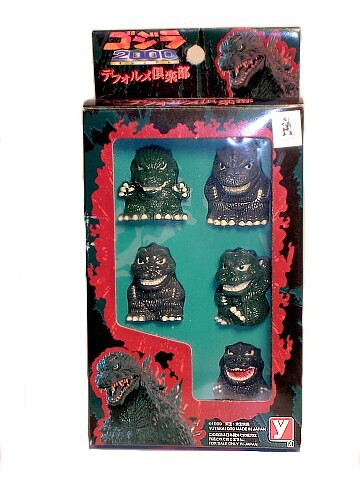 From Yutaka Co. of Japan, this 5 piece set of Super Deformed figures contains Godzilla 1954, Godzilla 1964, Godzilla 1965 (Jumping Godzilla), Godzilla 1994 and Godzilla 1999. Each Super Deformed figure is hollow and stands approx. 1 1/2 inches tall. Super Deformed figures are also called “Finger Puppets” because they can fit on a childs figures so they can “Fight” each other! Comes in colorful box. Made in 1999 by Yutaka. Funnnnnnnnnnnnn!! SUPER DEFORMED BOX SET # 1!!! Here is a VERY HARD to FIND item in Excellent Condition produced by Yutaka Company over 18 years ago in 1993. 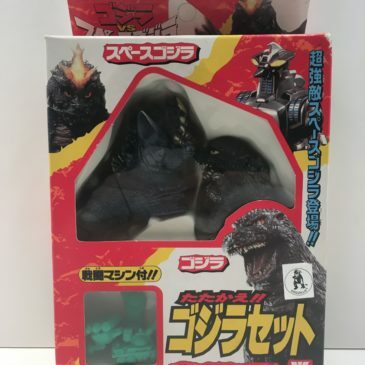 This is Part 1 which contains SD (super deformed) figures of the original style Godzilla, King Ghidora, Mothra Larva and Mothra. Super Deformed is a style very popular in Japan where the figures are compressed together giving them a sort of dwarfish look. The figures are made in very sturdy hard vinyl and beautifully painted. They have a nice gloss finish. THE SET COMES WITH A DISPLAY BACKGROUND CARD THAT SHOWS THE FORBIDDING LANDSCAPE OF MONSTER ISLAND! 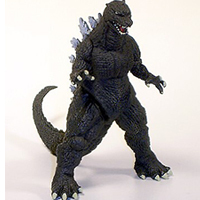 The Godzilla is about 1 1/2 inches tall, the King Ghidora is about 2 inches tall, the Mothra larva is about 2 inches long and the Mothra has a wingspan of 3 1/4 inches. The box is in EXCELLENT condition for its age. Actually, it is almost Near Mint Condition. Some of the most beautifully detailed and painted Super Deformed figures we have seen! 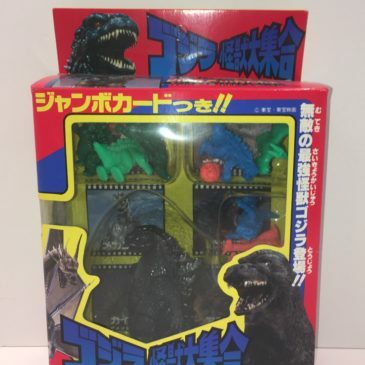 This Hard to Find Out of Production set contains 2 inch high heavy solid vinyl figures of Godzilla 1962, Godzilla 1991, Mecha King Ghidora and Mecha Godzilla 1974. THE SET COMES WITH A DISPLAY BACKGROUND CARD THAT SHOWS THE FORBIDDING LANDSCAPE OF MONSTER ISLAND! 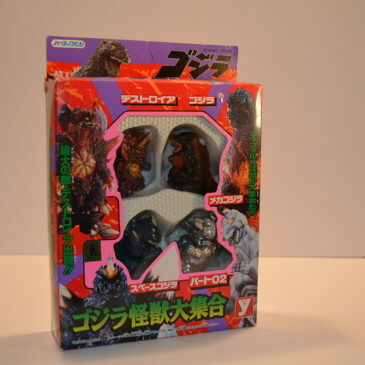 Made by Yutaka 1993, Comes in its orginal Excellent condition Box. Yutaka made 2 box sets for this series; this is part 2. The photo has a little glare on the box. 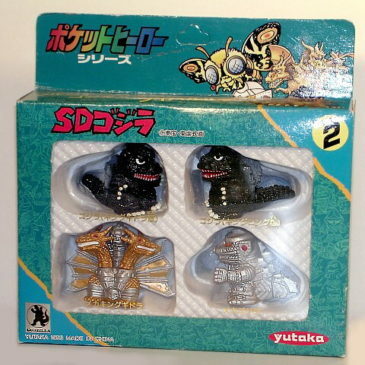 Yutaka Mini Figures Set. 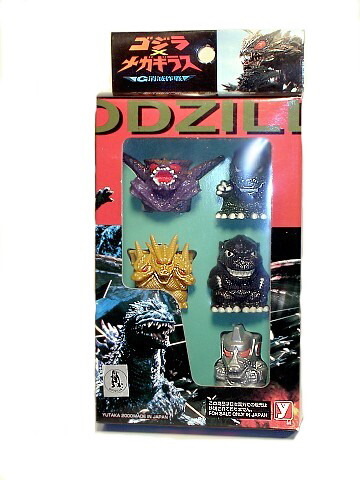 Includes 3 inch colorful vinyl toys of Burning Godzilla and Final Form Destroyer & 2 mini superweapons w/ card. Ages 4 and above.